Tuesday, a crowd of about 100 people gathered at Red Arrow Park downtown to remember Dontre Hamilton, the 31-year-old man who was shot 14 times by a Milwaukee police officer in April. Hamilton’s family was also in attendance. 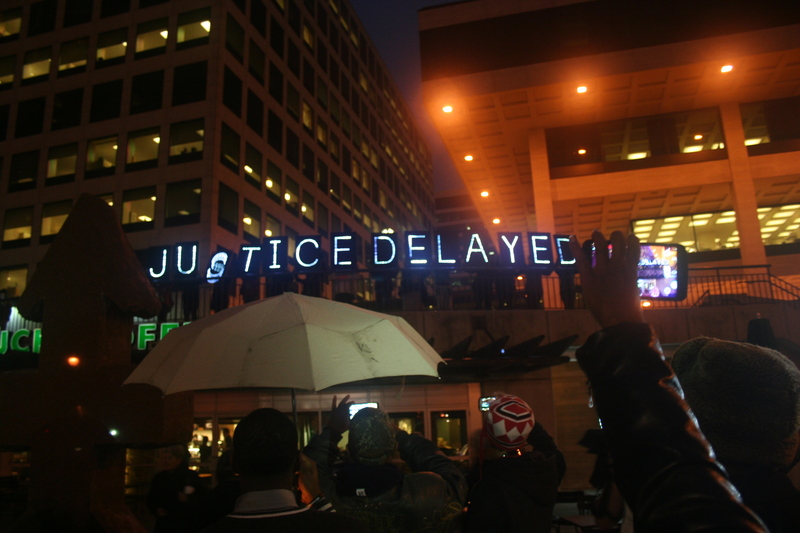 The rally, held on the five-month anniversary of Hamilton’s death, was organized as a remembrance as well as a call-to-action for city and state officials, who have failed to make a charging decision regarding the case or to release a report by the Wisconsin Division of Criminal Investigation, which was completed more than a month ago, while awaiting the results of another, independent, investigation. Alderwoman Milele Coggs also sent a letter to the Wisconsin Department of Justice requesting a copy of the report, Fox 6 reported. Others who have lost loved ones attended the event; among them were Michael Bell Sr. and Craig Stingley. Bell lost his son, Michael Jr., after he was shot in the head during a scuffle with Milwaukee police in 2004. Craig, the father of Corey Stingley, lost his son after three men, all civilians, restrained the 16-year-old inside a West Allis convenience store where Stingley had reportedly been attempting to steal alcoholic beverages. Stingley died of anoxic encephalopathy, brain damage caused by lack of oxygen. A casket and headstones, symbolize and remember the lives of Dontre Hamilton, Corey Stingley and others lost to violence in Milwaukee. In both cases, no one involved was charged and in Bell’s case a review board quickly absolved all officers involved of wrongdoing. According to Al Jazeera America, In 129 years, no Wisconsin police officer has ever been found by a review board to be at fault for killing someone. The killing of Michael Bell Jr. led to a 10-year mission by Bell Sr. to address the conflict of interest that presents itself when police departments investigate their own officers. His goal was simple: “If a police officer takes a life, let’s make sure that the department [that] was involved in that shooting doesn’t investigate itself.” Bell’s effort resulted in Governor Scott Walker signing a bill in April of this year that requires all officer-involved deaths in Wisconsin to be investigated by at least two outside investigators selected by the police department from an agency that does not employ the officer involved in the death. Craig Stingley has been vocal about the fact that he disagrees with Milwaukee County District Attorney John Chisolm’s decision not to issue any charges in the wake of his son’s death. Stingley has asked the United States Department of Justice to look into the case as well as, in late 2013, starting a petition on moveon.org asking Chisolm to issue charges of 2nd Degree Reckless Homicide. Currently, there are just under 2,000 signatures on the petition, the latest from Sept. 29 of this year. The deaths of Stingley and Hamilton have occurred within a larger, nationwide narrative of violence and use of excessive force against unarmed Black males, including the killing of Trayvon Martin by a civilian in 2012 and the recent shooting of unarmed Michael Brown by a Ferguson, Mo., police officer. Other recent incidents involve a South Carolina State Trooper shooting an unarmed man in a gas station parking lot when the man reached into his car after the trooper asked for his license and an Ohio man who was holding an air rifle being shot to death by police in a local Walmart. Protestors march down Kilbourn Avenue holding signs in solidarity with Dontre Hamilton, Corey Stingley and others. Craig Stingley said the response we’re seeing is a result of not only the feeling that justice is not being served in these particular situations but that these situations are also only the most recent chapter in an ongoing narrative that, over time, has eroded the public’s trust in law enforcement and the judicial system, in general. “When you see examples of it decade after decade after decade and, you know, it doesn’t change and then another black life is taken and the judicial system doesn’t do what it’s supposed to do, people start losing hope and faith,” said Stingley. As the protestors readied themselves to walk the streets of downtown, Steve Jerbi, senior pastor at All Peoples Church, implored the crowd with a message of hope. “We stand here, on hallowed ground, where the ground itself cries out for the blood that was shed here in this park. Month after month, week after week, we have come to cry out for a hopeful city, for a safe city, for a city that is not divided but a city that is united; for a city that will not stand for police officers to take on the title of judge, jury and executioner; to say that our public officials will not be able to turn away from our cries any more; to say that the time has come for Milwaukee to be free, for all lives to be liberated, for the forces of violence to be held back and to say that business as usual cannot continue. We are mourning the death of loved ones but we are also proclaiming a day of jubilee, a day when we will not be held back, a day when our voices will not be silenced. Whether or not we like it, change is one thing we will have to confront from time to time. or a personal piggy bank of the debtor.